I-86 begins at an interchange with I-84 and U.S. Route 30 (US 30) northeast of Declo. From the interchange, I-84 continues west towards Twin Falls and Boise and southeast towards Salt Lake City, Utah. I-86 travels east, concurrent with US 30, through rural Cassia County for about 14 miles (23 km) to its first exit at Raft River near a crossing of the river of the same name. From Raft River, I-86 follows the Snake River upstream through the Minidoka National Wildlife Refuge and crosses into Power County. The freeway continues northeast between the Snake River and the Sublett Range and passes a set of rest areas near Massacre Rocks State Park, one of the state's most popular tourist attractions. Near Neeley, I-86 passes a wind farm and intersects State Highway 37 (SH-37), which provides a southerly connection to Rockland. A business route of I-86 also terminates at the interchange and continues along the north side of the freeway as it approaches the city of American Falls. I-86 bypasses the city on its east side and intersects the business route and SH-39 near American Falls Airport. From the city, the highway runs along the south side of the American Falls Reservoir and follows a railroad into the Fort Hall Indian Reservation. I-86 passes through the northern section of the Fort Hall Reservation, serving exits to Arbon Valley and the Pocatello Regional Airport. US 30 leaves the freeway at an interchange located between the eastern boundary of the reservation and the Bannock County line on the Portneuf River. US 30 continues southeast into Pocatello while I-86 runs through the northern suburb of Chubbuck. The highway intersects US 91 in a diverging diamond interchange, the first to be built in Idaho, on the northeast side of the Pine Ridge Mall. I-86 continues east for approximately one mile (1.6 km) to a directional T interchange with I-15 at the north edge of Pocatello, where it terminates. At 63 miles (101 km) in length, I-86 is one of the shortest primary Interstate Highways in the contiguous United States. The highway is maintained by the Idaho Transportation Department (ITD), which conducts an annual survey of traffic on certain highway segments that is expressed in terms of average annual daily traffic (AADT), a measure of traffic volume for any average day of the year. The busiest section of I-86 is near its eastern terminus in Chubbuck, carrying an average of 27,158 vehicles. The least-traveled section, near Massacre Rocks, sees only 6,759 vehicles on an average day. The route of Interstate 86 largely follows the westernmost section of U.S. Route 30N (US 30N), which split from US 30S at Burley and continued east into Wyoming. The corridor was part of the Oregon Trail in the 19th century and was later marked as an auto trail. It was designated as State Highway 16 in the early 1920s, prior to its incorporation into US 30N in 1926. US 30N was realigned onto a new road near Raft River in 1952, with the intention of upgrading it to a four-lane limited access highway. In the original plans for the national expressway and freeway system, which would later become the Interstate Highway System, Pocatello was served by two major highways along US 30N and US 91 and a spur route along US 30N that was removed from later plans. 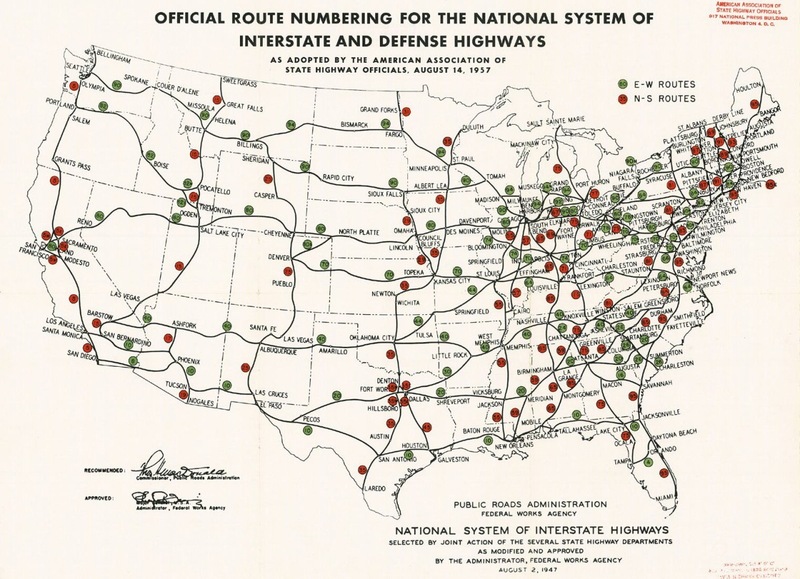 After the Interstate plan was approved by the federal government, present-day Interstate 86 was numbered as part of Interstate 82N, but was eventually designated in 1958 as Interstate 15W. Construction on the first section of I-15W, a four-lane bypass of American Falls, began in May 1958 and was completed in October 1959. The westernmost stretch of the highway near Raft River was opened in 1963 as part of work on Interstate 80N east of Heyburn. The Chubbuck section of the freeway was opened to traffic in July 1968 and was followed three months later by an extension to the Pocatello Air Terminal 4.6 miles (7.4 km) west of the city. I-15W between American Falls and the airport was opened to traffic in September 1972. U.S. Route 30N was superseded by U.S. Route 30 in 1972. In 1973, the American Association of State Highway and Transportation Officials adopted a new preference for duplicate numbers in lieu of suffixed designations. As a result, Interstate 15W was re-designated as Interstate 86 in 1978; it was originally submitted as part of Interstate 84 (the successor to I-80N). By 1980, most of the freeway was completed, except for a 21-mile (34 km) section between Raft River and American Falls that was graded and scheduled to be temporarily paved. The final four-lane section was constructed at a cost of $33 million beginning in 1978 and was dedicated on October 11, 1985. The highway's construction was delayed by careful rock blasting next to utility lines, historic sites, and native wildlife habitats. The interchange with US 91 in Chubbuck was later rebuilt in 2013 as the state's first diverging diamond interchange, which helped reduce the rate of collisions at the interchange. Interstate 86 has a single business route, Business Loop 86, which runs between two interchanges in American Falls. It travels northeast from the SH-37 interchange into downtown American Falls on Lincoln Street and Fort Hall Avenue, following the former route of US 30N. The route turns west onto Idaho Street for two blocks and crosses over a railroad before beginning its concurrency with SH-39 around the northwestern side of the city. The highways turn northeast onto Pocatello Avenue, which leads to an interchange with I-86 on the south side of the American Falls Airport. The business route was originally created in 1972 as Interstate 15W Business, replacing a section of SH-37 within American Falls. This page was last edited on 24 September 2018, at 03:52 (UTC).